Less than ten kilometers in and I’m exiting my third port-a-potty, three port-a-potty stops into the 2015 Vancouver BMO Marathon. The run is quickly becoming a list of ‘what not to do’ in undertaking a marathon. Foremost, in embracing the spirit of the moment and adventure I had signed up for the marathon the day before on a whim. That means the standard regime of long distance run clinics or even workout schedules had been given a miss, then there was the dinner party the night before. Why the spur of the moment sign up? I’d like to say I’m a runner now. That I felt confident in my ability to compete the marathon, but the truth is more along the lines of some psychological thrashing about. By my standards I’ve fallen into a conventional work-a-day life. I needed a challenge to shake things up, and no fresh one day adventures were handy. So, I’d sauntered down to the Marathon Expo too check it out, with half a mind to running the half-marathon. Why just do a half-challenging though? If you’re pining for a bitof adventurism, why stop at a bit? Plus I have a personal thesis; humans, inherently, are built to run. Humans, compared to most quadrupeds are crap sprinters, but we are well evolved to run distances. Our tendons and ligaments are elastic tissues that store energy, stretching and releasing energy as they recoil, which is of little use when we’re walking. The arches in our feet acts like an elastic spring, that creates rebound energy when we run, but not when we walk. Our joint surfaces are increased compared to our close primate relations, allowing us to deal with the impact force of running. Our toes are shorter, requiring less mechanical stabilization in running. The list goes on, per Bramble, D.M. & Lieberman, D.E. “Endurance running and the evolution of Homo,” Nature, 432 (2004). These adaptations have tie into the persistence hunting hypothesis. Persistence hunting, where in we Homo are capable of running our prey down to the point of its exhaustion, and our throwing it on a fire, doesn’t have much play in the world of order in pizza. However, any modern human in halfway decent shape should, even on a whim, be able to wear down the prey of completing a marathon. The assumption being of course that we, to a greater or lesser degree, all have the mechanics to run long distances; mechanics we smother in the big mac fat and disuse of a westernized world. So the assumption is I’m in halfway decent shape. I’m carrying about 2 kilograms too many. I’m running 10kms about 3 to 4 times a week. I cycle the 10km round trip to and from work with the same frequency. What had been my spring marathon training plan was interrupted by Christmas, and then an infection I’ve not been able to shake for the past three months. So, my preparation runs counter the ‘running as industry’ high volume mileage training most marathon clinics embrace. So a simple plan. Walk the hills. Stop at the water and electrolyte stops and actually drink, rather slopping it all over myself then ending up in a hacking fit because it went down the wrong pipe. Humans may be built to run, but we aren’t built to run and drink from a paper cup. Take in nutrition at every stop that offers it, and stockpile extra gels and goos for later in the race. Stop and stretch if I’m getting tight. Concentrate on my running form. And, keep smiling. While this marathon is me experimenting with my limits a bit, the mindset and strategy is based on what I’ve observed ultra runners doing to complete 100km races. And they are just human right? Or at least provisionally human? Where it all went a bit sideways was the pre-race dinner; a turkey dinner at a friend’s place, which I shamefacedly must admit to having forgotten… Until I was reminded just after I’d done the last minute race entry. Turkey and I don’t get along well. By the time we’d returned home from dinner, I’d lain out my gear for the next morning, and had done my stretching, it was a 1AM bedtime. At 4AM I woke up with pre-race jitters, so stretched for about 45 minutes to reduce tension and set up my iliotibial band for the race rather than just wonder the apartment aimlessly. 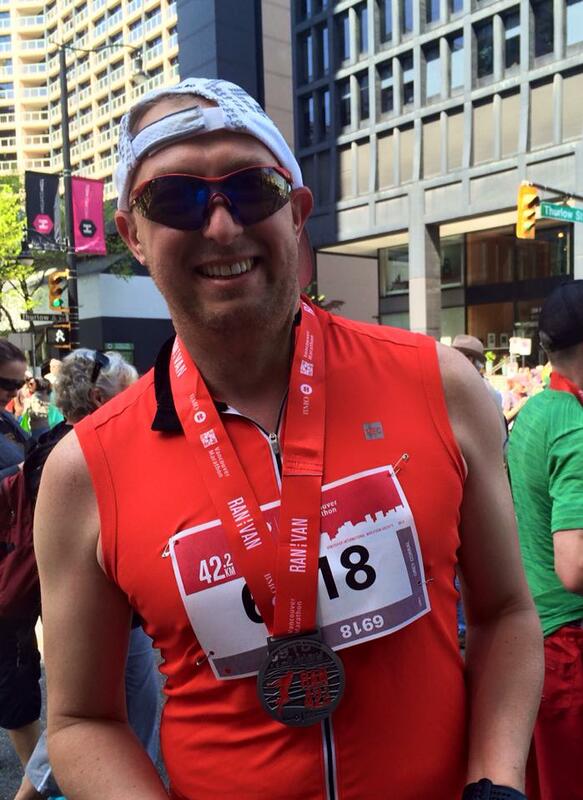 All of which brings us to Sunday May 3rd, 2015 and the BMO Vancouver Marathon. In reality the first 10km of the race wasn’t optimal. Actually it was the closest I’ve been to quitting any race. The reason may well be why Turkey Trot is the most popular name for Thanksgiving runs. And we are hitting that worst point, at 10km out even in the 4:30 to 5 hour marathon set, there are people having a truly rough time. One man is talking to a loved one who’s come out to show support. She responds with, “You’re not making any sense dear. Have you been drinking the electrolytes? Are you ok.” I’ve been drinking the electrolyte kool-aid… and the water and the goo, even with that at 5km out I’m really feeling my legs and the psychology of the distance. Anything the forces me to vary my pace, leaves me wondering if I’m going to be able to resume running. Do I stop for water? If I do, will I be able to start again? I’m passing other runners who are slowing to a grinding gate or a slow walk left, right, and center as I attempt my end of run “kick”. That I have the energy to even attempt such a thing, on only base training for 10k runs, limited sleep and a non-traditional dinner, has me feeling pretty good about the endeavour. The “kick” though is more mental than anything I’ve done before, my body has more in it, but it really doesn’t want to give that more up. So would I do it again? Yep. I’ve not learned my lesson at all. Actually, I’ve learned a few. Marathon fitness and finishing is easier to do when free of expectations around time. My goals and plan were to take care of my body and needs to finish the event, not run for an outside metric of a given pace or time. That can come in future races. I’m suspect of the running as industry high mileage training plans and clinics that are the current norm – we are built to run. Perhaps a lower volume and more moderate training plan can get us to Marathon fitness; that starts by unloading some of the fat and disuse from our evolutionary underpinnings though. Stretch! This is the biggest take away from my friend Dave Melanson over at Project Talaria (http://www.projecttalaria.com) and his awesome (and “slightly painful in a good way” stretch classes). Stretching was integral to maintaining my form for the race. To do it again, I’d pick a trail based marathon. Pavement is simply hard on your body, in fact during this run I got off it where ever there was grass or a side trail to the road to give my body a rest. Skip the kick; without the kick I had enough energy for at least 10 more kilometers. I finished the race, sauntered about, and then walked home. Had I not attempted a kick at the end, I likely could have done 50km – putting me in short Utra territory (provided it was flat). Skip the turkey; and by that I mean just plan ahead for a meal more in line with the needs of the event. In the end though, despite all this ‘learning’ I’d still add some volume marathon training to my fitness regime in order to better my results, or potentially go further… A thought, which purposes another experiment.